Now Dug’s on the wrong side of that thousands-strong army he hoped to join ¬- and worse, Zadar has bloodthirsty druid magic on his side. All Dug has is his war hammer, one rescued child and one unpredictable, highly-trained warrior with a lust for revenge that’s going to get them all killed . . . I don’t read enough historical fantasy. 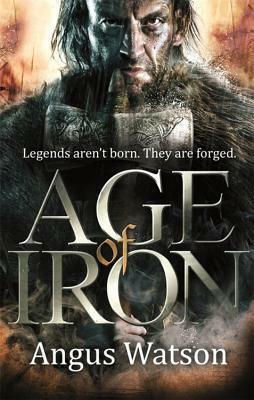 Age of Iron was a book I was almost afraid to read because I wanted to like it so much. It’s a really cool premise, a historical fantasy set in the Iron Age in England? Yes, please. It’s a period of history that we know enough about, but not a ton compared to so many other parts of history. There are a lot of gaps in our knowledge that allow authors like Watson to fill in what we don’t know in really interesting ways. Age of Iron follows a few primary characters – Dug, who is the primary perspective, more or less. Then there’s Spring, a young girl he picks up along the way and Lowa, who is absolutely pure badass and Ragnall, who grows into himself throughout the book. The Iron Age wasn’t a fun period of time. It was rough and brutal and horrible for many, and Watson’s characters reflect that. None of them have had lives full of unicorns and rainbows. They are all scarred and toughened up by the lives that they have been forced to live. Even the richest of them live a life I wouldn’t want. It’s realistic in those ways, and it’s incredibly gritty, not just in events, but in the characters. For example, Dug rarely bathes, and often talks about his body odor. Now, that might be less than pleasing to read about, but the fact is it’s real, and it’s those details that I’m a huge sucker for in the things I read. Dug comes from the north, where they barter for goods, and travels to the south where coin is just coming into play, and he’s awkward with it. The book is full of details like that that make it sing. Along with those three main characters, a few other perspectives come and go throughout the book. It’s refreshing to get the viewpoints from all sides of the conflict. While some are obviously “evil” and some aren’t, each character is rather morally gray. Life is about surviving, and that simple fact really simplifies some things, and makes others a bit more complex. The book moves very quickly, and it’s absolutely packed with action, incredibly gritty action. In fact, if you think you might shy away from some forms of cruelty, then I suggest you don’t read this book because it probably has it in it. Now, normally I’d say something like that and then imply that it felt a little gratuitous in places, but I didn’t get that feel with Age of Iron. Probably because the world that Watson has crafted is gritty and dark and horrible, being anything less than what it fundamentally is would seem like it’s not being true to itself. The magic is rather subtle, and plays on Druids who can easily become just as corrupt as the most impressive Borgia you can dream up. They aren’t all good, and they aren’t all bad, and the magic ranges from anywhere to real and impressive to fake and based on sacrifice and guesses. It plays a huge role in the politics and the movements of the armies and peoples, and it’s very well done. It’s nice to see a less flashy historical fantasy where the magic felt just as real and corruptible as the people in the novel itself. Watson really put thought into the novel, and you can tell in any number of ways, from the small details that I mentioned above, to the absolutely spectacular characters. Watson breathed fresh life into them. Every single character belonged in the world they lived in. Perhaps most impressively is how Watson gave each character a backstory, something that readers could focus on that gave that person’s actions a little more depth and impact. How he managed to do all of that without bogging down the plot blows my mind, but he did, and it works in a big way. Age of Iron isn’t all blood and guts, though. There is a lot of humor in here, too. Watson has a way with making even the most grim scenes a little lighter with some dry, cynical humor and it is incredibly appreciated. A book like this needs some levity to balance it out. Furthermore, Watson keeps it all very accessible with more modern language. Arguably, some readers might be bothered by that, but I enjoyed it. It allowed me to sit back and really dig into the story without taking time to adjust to the vernacular. Age of Iron has a lot to love. It’s a very powerful story that starts moving like a bat out of hell from page one. The characters are impressively crafted; the world is detailed, nuanced and layered. The book is dirty and gritty, but realistic despite all of that. There’s action and adventure, love and kinship, and bond of loyalty explored. It’s set in a rather mysterious part of history that makes it that much more delicious. As far as historical fantasy goes, Watson hit the ball out of the park. This is an incredibly impressive effort, and I’m very excited to see what happens next. I don’t know how this one slipped my radar; I was completely unaware of it until reviews started coming out. Glad you loved it, I will add it to the proverbial list. You know, I got it from the publisher a crazy amount of time ago and totally forgot I had it until right after surgery. I’m glad I found it again… But I’m kind of surprised by how many people aren’t aware of this one. It’s sad. I am so glad to see another review of this! And one that enjoyed it as much as I did. No idea why it hasn’t been mentioned/read more. I know!! I can’t figure out why some books don’t make the noise that they should. This one was fantastic. I hope lots of people find it.